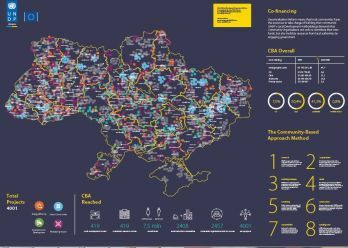 Over the last 10 years, CBA Project supports sustainable local development across Ukraine. Since 2008, we reached over 80% of the country to support initiatives of local communities. By creating an enabling environment for individuals to become active citizens, EU/UNDP’s Community-Based Approach (CBA) to Local Development has promoted sustainable, socio-economic development in Ukrainian communities that empowers individuals and spreads long after the intervention. EU/UNDP facilitates and trains citizens and public officials to take the ‘leap of faith’ needed in rural Ukraine to engage with public institutions, laws, and resources. Want to know more what we have done, check the link: http://bit.ly/2v5AMr8. We managed to press in 10 years in only 8 pages and one map!